In Brisbane, there is so much to explore as an expatriate, but aside from the sightseeing and coastal thrills, there's also the important issue of cost. Although not exactly cheap, life in this city can be affordable to those who work hard. Expats who are settled or planning to settle in Brisbane usually prefer to rent a flat instead of owning a house for practical reasons. Rentals will vary depending on the number of bedrooms, the size of the property and, of course, the condition in which it comes. Monthly rent for a furnished three-bedroom house can cost as low as 1,920 AUD or be as high as 3,600 AUD per month. Rental costs for a fully furnished two-bedroom house can cost 1,720 AUD to 3,800 AUD while the cost of rent for a 1 bedroom flat with an attached bathroom can cost about 560 to 1000 AUD, although it depends on the location. When buying property, it is always recommended that expats hire a real estate agent who can provide assistance with the property purchasing process. Australian real estate laws may remain unfamiliar and, to avoid legal problems, an agent who knows the Brisbane landscape is best to handle such type of transaction. One thing expats like about Brisbane and every other city in the Australia is their eligibility for government assistance when buying a house for the first time. The median home price in all of Queensland is now at 330,000 AUD which, compared to Melbourne, Sydney and other Australian cities, is much more affordable by over 50%. People end up paying less for house utilities when they rent instead of own their own homes. In fact, this is just another reason why rentals are always the better choice for expats in Brisbane. Usually, a 150 AUD fee is collected at the end of each month to cover electricity, water, cable tv and Internet costs along with other household expenses such as gas, garbage fees and the like. The cost of monthly internet connection can range from 60 AUD to 82 AUD. Weekly supermarket costs in Brisbane for a family of four could be around 200 AUD plus about 50 AUD for additional fresh produce. Anytime within a week or even a day, the different supermarkets offer random discounts of up to 30% on individual products. Expats who need a little more freedom in their budget tend to program their buying time around these specials. On the other hand, eating out can be a little of a luxury, especially to those who've just moved. River canteens on the boardwalk, which are favorite spots for Australian lunches and dinners, could cost between 50 - 70 AUD while finer restaurants such as those that serve modern renditions of French Bistro food would cost from 70 to over 100 AUD per meal. A daily meal in the city’s business district will cost 16 AUD while a dinner for two in an Italian restaurant with wine and dessert will cost about 105 AUD. On the cheaper side, a Big Mac Meal will cost 8.50 to 10.00 AUD. Buses, trains, taxis, and ferries make up the city's public transportation system. Pensioners, students, and children enjoy discounts as long as they bring proof of age or, for the seniors, pension cards. Taxis charge the same rate during peak and off-peak hours - 1.87AUD per kilometer covered. The only difference is the flag down rate which is 2.70 AUD on peak hours and up to 6 AUD during off-peak hours. An all-day ferry pass will cost about 5.40 AUD during peak hours and some 3.90 AUD before or after. Expatriates who own cars will have to note that a liter of gas will cost about 1.40 to 1.60 AUD. 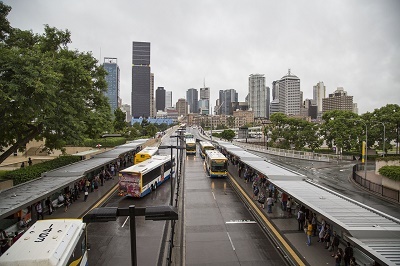 When it comes to public transportation, one monthly ticket will cost about 148 AUD while one bus ticket within the inner city will cost 4 to 6 AUD. Brisbane is Australia's third largest city next to Melbourne and Sydney and is in the top 30 list of premiere expat destinations in the world. True enough, the Brisbane City Council says over 15,000 people migrate to the city each year. Brisbane holds a population composed of 2,238,394 people, and 28% of residents make up the expat population in the city. With the easy availability of public transportation, job opportunities and high quality of life, the reasons why many choose to relocate internationally to Brisbane are not hard to understand.